Guided by a beautiful book my sister gave me, The Stylist’s Guide to NYC, I’m discovering a lot of new nooks and crannies full of weird and wonderful things. There’s something I love about shops with really specific inventory, and I’m planning a little exploration of the garment district and places that sell nothing but lace, or ribbons, or buttons. This week I followed the book to New York Cake & Baking Distributors which is a pretty self-explanatory name. If I were doing their marketing I’d have suggested something more like THE DISNEYLAND OF BAKING up in Broadway-style neon lights because this place is amazing. 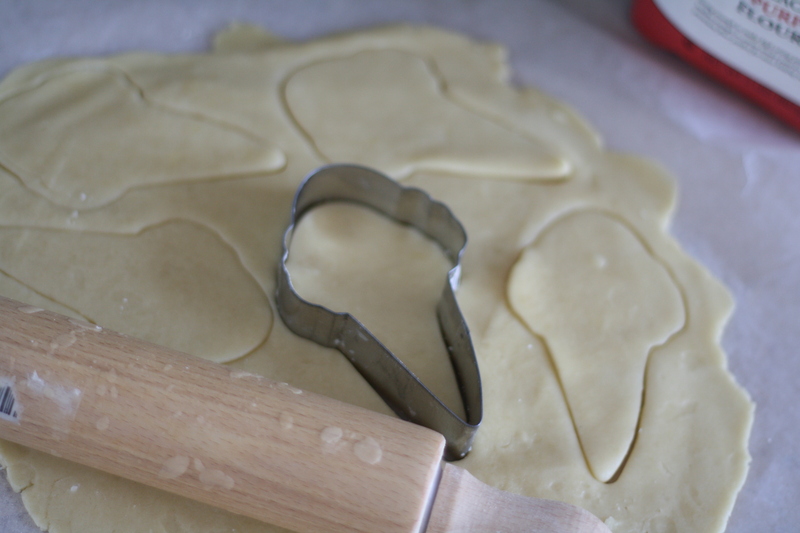 I walked in the door and didn’t move for about half an hour because I was immediately face-to-face with an entire wall of cookie-cutters in every shape you can imagine. There are aisles of colour-graded jars of hundreds & thousands (or “non-pareils”, as they’re fancily called here). There’s a wall of pattycake papers in all kinds of patterns. Cake tins, toppers, fondant moulds, chocolate moulds, edible glitter, giant buckets of icing…. It’s intense. Somehow I managed to pull it together and left with just a couple of things. 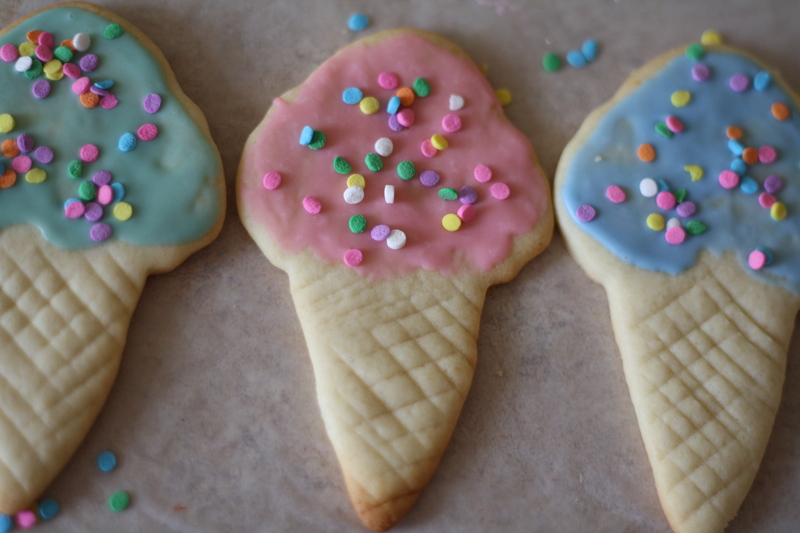 Inspired by an ice-cream cone cookie-cutter, I could already visualise the pastel sweet treats I’d make. The next day dawned unbearably hot, but I was undeterred. I supposed if you insist on baking through a heatwave, you may as well end up with something that looks cool. 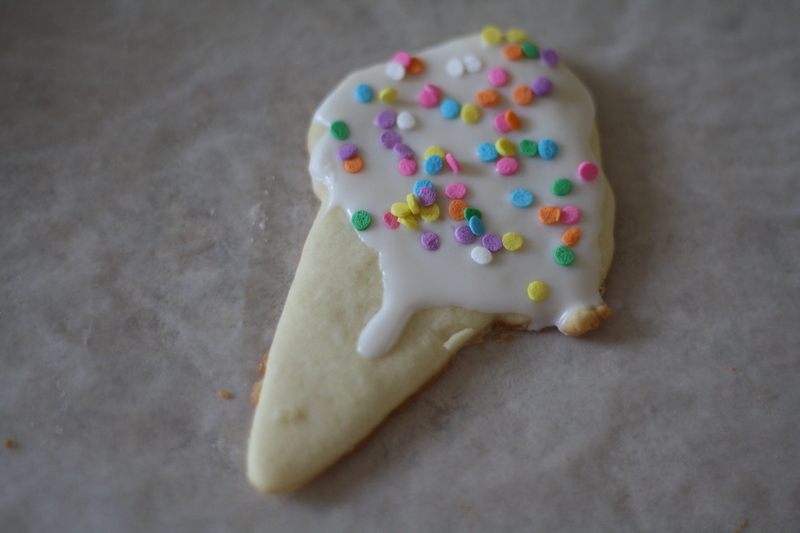 I used this basic sugar cookie recipe and thankfully I read through the comments and found some helpful tips. Like rolling out the chilled dough directly onto parchment paper and peeling away the excess dough from around the cut shapes. Other lessons learned: when opening unfamiliar food-dye , do not use your teeth or risk semi-permanent green lips. It’s not my usual modus operandi, but I used a squeeze-bottle of white pre-made cookie icing from a brand called Wilton, tinting it in small bowls with their pastel gel icing colours. Spills aside, I spent the afternoon literally painting on icing with a brush and feeling very proud of myself (if a little underemployed). And when I made some cookie deliveries around the city the next day, another stinker, I was very pleased to see the icing didn’t run or melt despite the heat. Non-melting ice-cream cones? I am clearly a genius.